Veins aren’t blue, but why do they look that way? Research life can be a lot of things—brainstorming experimental ideas, fixing broken equipment, crunching through complex theories. Sometimes you lift your head out of a textbook and realize you’ve stumbled across the underlying physics behind some simple everyday phenomenon, but you wouldn’t have seen it without trudging through the equations. Since at the end of the day many of us are driven by a desire to understand the way the universe works and to share that with others, I’ve made a blog, Everyday Physics, to explain events you see every day through the fundamental physics at their foundation. A common misconception about blood is that it looks blue when depleted of oxygen, explaining why lighter-skinned people see blue veins in their arms. Here I’ll talk about how deoxygenated blood isn’t blue at all, and that the real reason for the color shows off some interesting aspects of how light interacts with matter. Unlike water waves, light waves are able to travel in the absence of a medium—they come from stars to our eyes through empty space just fine. Light waves can also travel through materials as well, which often has some noticeable effect on the wave. 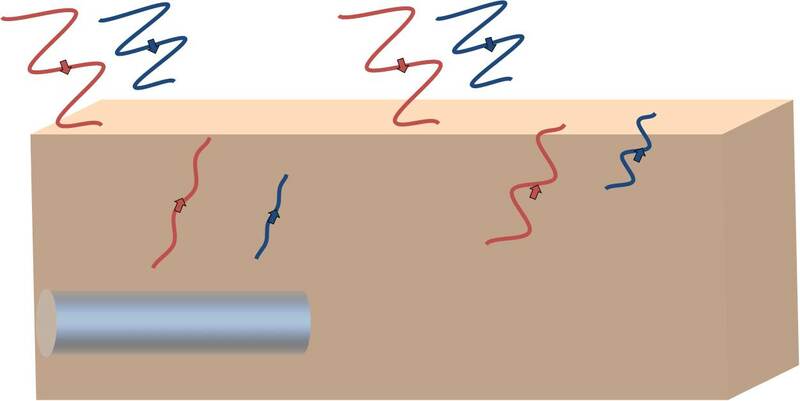 Specifically, light is composed of oscillating electric and magnetic fields, and these fields will interact with and respond to atoms they encounter. The details of exactly how light responds to a material reveal a lot of interesting physics. Visible light incident on a material tends to give its energy up to electrons, increasing their energy via a process known as excitation. Excited electrons will eventually give off this energy, and can do so in a number of different ways—fluorescence, as is seen in neon shirt coloring, is one phenomenon that stems from one sort of de-excitation, but that’s another post. Often de-excitation occurs simply by the re-emission of the same frequency light that initially interacted with the electron, or by that excited electron knocking into an adjacent atom and transferring the energy away as heat. The structure of an atom governs which energies will tend to excite electrons, or in the case of light, which frequencies will be absorbed into exciting an electron. Regardless of how that energy eventually leaves the electron, that frequency (or color) of light will be missing from the spectrum of light that originally hit the object. In this way a banana looks yellow because its structure is absorbing all frequencies of visible light except for yellow. Another effect that prevents light from going further into a material is scattering, where light gets deviated from its original path because of something in the way. The details of scattering lie at the heart of a lot of everyday physics—things like why the sky is blue, or why beer foam is white—but that’s another post. It turns out that the size of the scattering particle relative to the wavelength of the incoming light determines the nature of the scattering—just like a ping-pong ball thrown at a beach ball will recoil differently than if it’s thrown at a marble. The little density changes in skin and fat tissue are such that blue light tends to be scattered more than red. This means blue light won’t reach as deep in your skin before it gets knocked off course. You can test this by holding a bright flashlight on one side of the thin skin between your thumb and fingers—it’s red-tinted because those red frequencies are the most able to make it all the way through your skin. More blue light gets absorbed and scattered on its way through your skin than red light because of the structure of skin and fat tissue. Once light reaches a vessel, which contains red blood whether its an artery or a vein, more blue light gets absorbed than red light, which is why blood looks red on its own. Let’s focus now on two areas of your arm: one area where there is a big vein underneath skin (the vein region) and an area right beside that with no vein (the no-vein region). Skin with less melanin will be lighter, which means most incoming light gets reflected—so it appears white. Now, the blood inside the (mostly translucent) vein instead mostly absorbs light of all frequencies, but reflects a little bit in the red area of the spectrum—that’s why blood looks red. 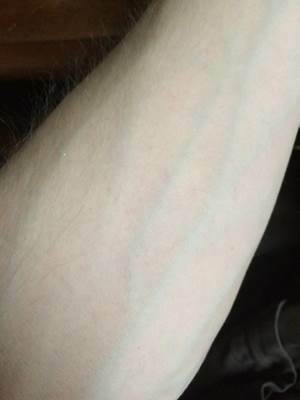 Veins will look blue because the ratio of red light to blue light returning from a vein is a bit smaller than the ratio of red to blue light returning from nearby skin. This is because less blue light made it down to the vein to be absorbed there. 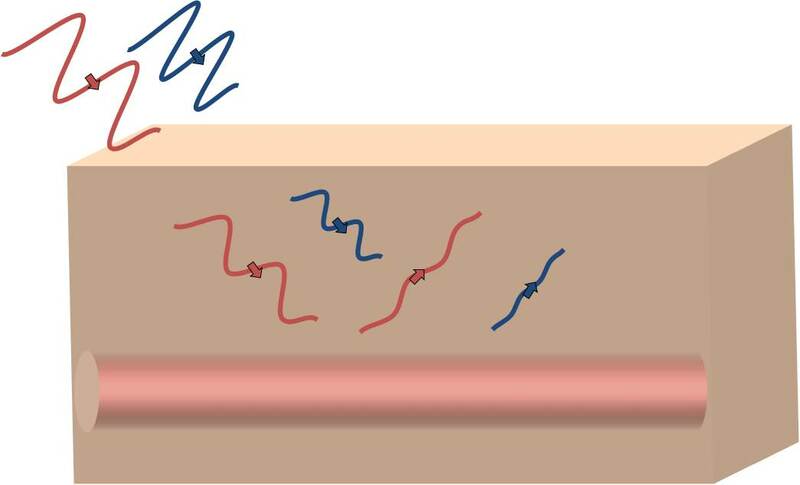 In both areas more red light comes back than blue—so then why do the veins appear blue? Both red and blue light get partially absorbed on the way to the vein. More blue light gets scattered on its way down to the vein. Blue light gets absorbed more than red once it reaches the vein. In fact, there is more red light than blue light seen from the vein region of skin and from the no-vein region. So then what makes the veins appear blue? Believe it or not, the blue bars are the same color here, but look different if they are more surrounded by white or red. Your brain perceives the color of an object partly based on the surrounding colors, and the same thing is going on when you look at a vein beneath your skin. Your brain can be fooled sometimes when it observes colors and patterns—this is the basis for most optical illusions—and there is a similar thing going on here. Even though both regions of skin reflect more red light than blue light, the no-vein region reflects a greater ratio of red to blue light than the vein region. This is because less blue light made it down to the vein and is absorbed strongly there. Your brain interprets the vein area as a little bit bluer by comparison to the surrounding skin. The same thing happens when you look at the figure above: the blue rectangles are the same color everywhere, but look a bit darker on the right where they are more surrounded by the darker red instead of the lighter white. 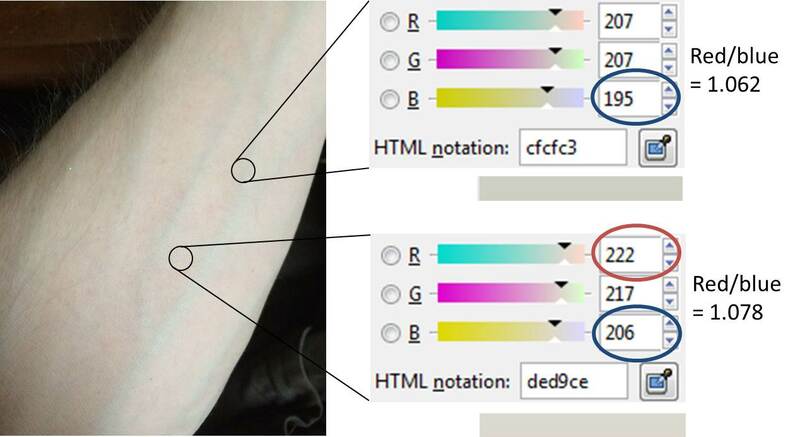 Here’s a picture of my arm for proof—notice how the red value is higher in both regions, but the ratio of red to blue is just a bit higher in the no-vein area (bottom part of the figure). It turns out this blue vein effect only happens for bigger blood vessels that are a certain depth under your skin. It’s easier to see veins than arteries because they are typically larger when they are near your skin surface, like in your wrists and forearms. If you happen to have a vessel with even less skin covering than this, it will appear its natural red—take for example the vessels in your eyes, or on your retina. 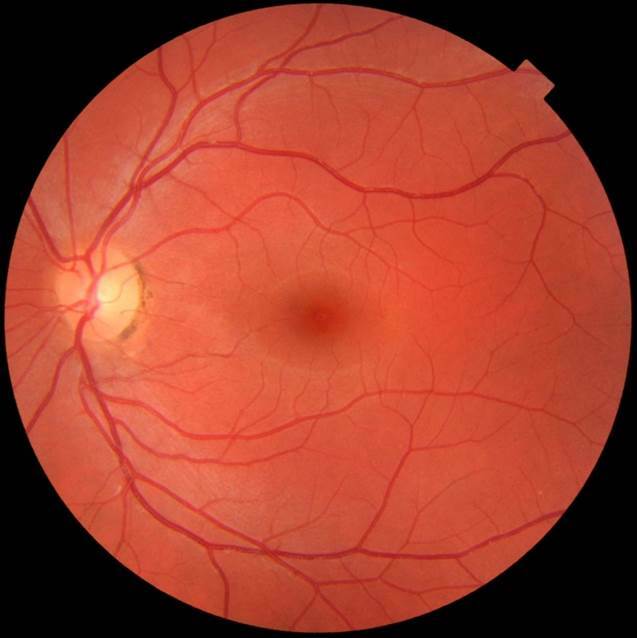 This is a picture of someone’s retina, along with the arteries and veins that supply it blood. The vessels of the retina are some of the least covered in the body—here there isn’t enough tissue covering to create the blue vein effect. Human blood (and that of many other animals) uses the molecule hemoglobin, where oxygen is bound to iron atoms. It’s this iron content that gives blood its red color, which the presence of oxygen makes a bit brighter. Creatures that don’t use iron to bind oxygen can have different color blood. For example, copper is the main oxygen receptor in hemocyanin, which is present in the blood of lobsters, snails, and spiders—as a result, their blood looks blue. It’s copper carbonate that makes copper statues turn green (like the Statue of Liberty), so perhaps this is involved in the famously green blood of Vulcans. Perhaps Vulcan blood is green for the same reason statues are. 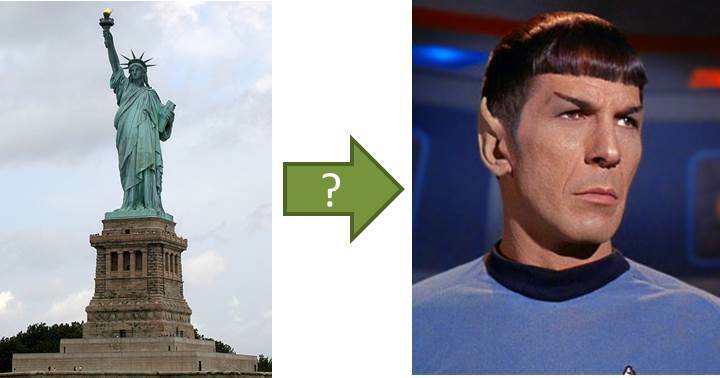 Thanks to Elcobbola (Wikipedia) for the Statue of Liberty picture and Memory Alpha for the Spock picture. I grew up on farms in Valdosta, Georgia, and did my undergraduate work at the Georgia Institute of Technology. 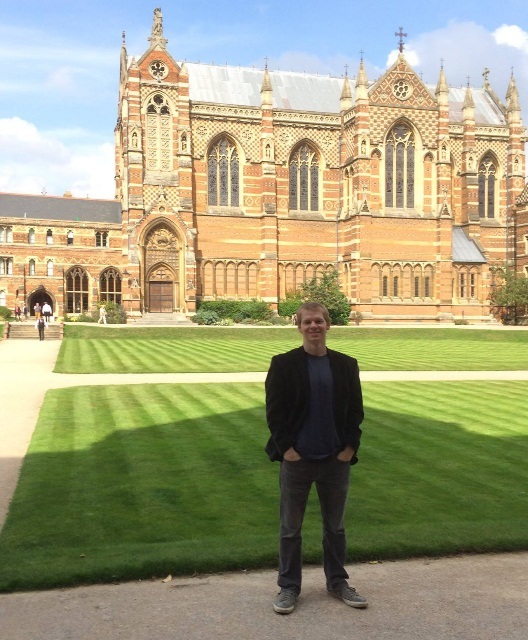 Currently I just defended my PhD, which focuses on creating star-like temperatures and pressures using the ultra-intense Scarlet laser here at OSU. In my spare time I write on my science blog, www.everyday-physics.com, and perfect my mean racquetball serve.